The long wait for the launch of all-new Maruti Suzuki Swift is over. The new generation car has been just launched at the 2018 Auto Expo. Readers would remember that the booking of the new car was started at the dealership in the first week of January 2018 by making a token deposit of Rs. 11,000/-. Now with the official launch, the all-new hatchback would be available all over India later this month. The new car has a waiting period of 6-8 weeks at present. It is priced little over the earlier version but it is much cheaper than the Baleno. You may also read: What’s New about New Maruti Suzuki Swift 2018 ? Here is all that you may be interested to know about the new car. The new car which boasts for better features, performance and fuel efficiency has a starting price tag of Rs. 4.99 lakh (ex-showroom Delhi). The top end variant is priced at 8.29 lakh (ex-showroom Delhi). The starting price is lower than the Baleno which start at 5.47 lakh. 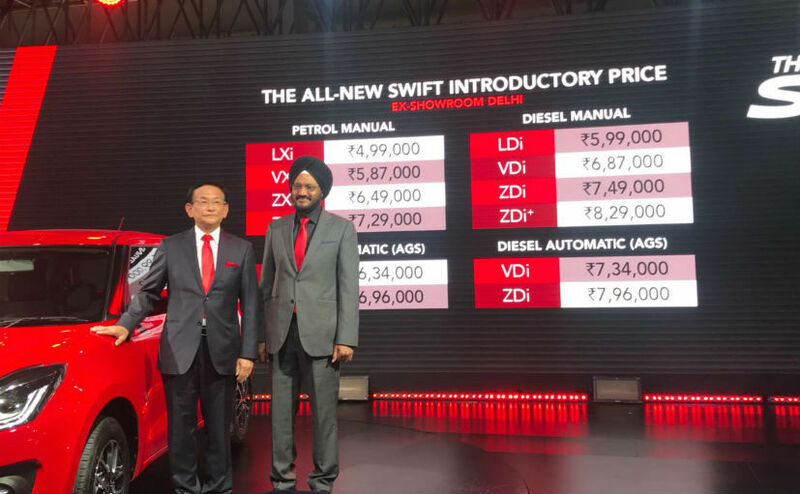 You will notice that the diesel variants are priced exactly Rs. 1 lakh above the petrol variants. The company claims the mileage of 22 kmpl for the petrol variant and 28.4 kmpl for diesel version. 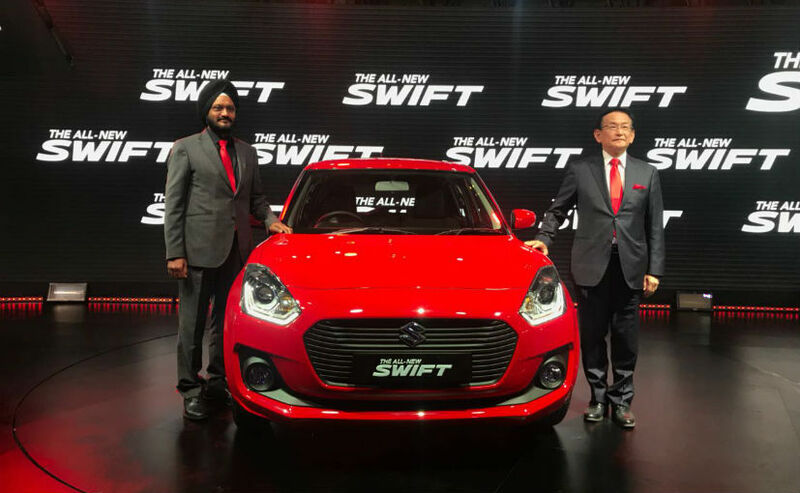 The all-new Maruti Suzuki Swift has been built on the lighter and modern Heartect platform giving it a much rigid and stronger structure. Thanks to the new platform which makes it 80 kg lighter than the previous models in both petrol and diesel trims. The front has a large grille and bug-like headlamps with projector lens and LED DRLs on the top rims. To further enhance the look, the car comes with diamond cut alloy wheels and LED tail lights. The petrol variant comes with 1.2 litre K-series, 4-cylinder engine which churns out 82 Bhp power and 113 Nm torque. The diesel variant gets a 1.3 litre Fiat multi-jet turbocharged engine which delivers 74 Bhp power and 190 Nm torque. Both the petrol and diesel variants come with 5 speed manual and AMT options. All the variants of the all-new Maruti Suzuki Swift come with twin airbags and ABS as standard. The new car also gets an all-new cabin with new design elements. 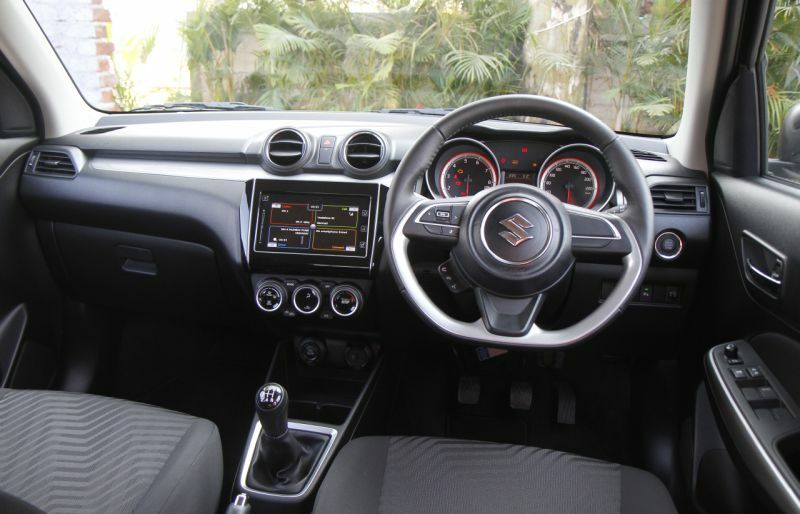 It comes with dual-pod premium instrument cluster and a flat-bottom steering wheel giving a sporty touch. It also offers the latest SmartPlay infotainment system that supports Apple CarPlay, Android Auto and climate control on the top variants. The car also comes with keyless entry, push button start, 60:40 split real seats and a larger boot of 268 litres. One can make the booking of the new car by making a payment of Rs. 11,000/- at the dealership. Don’t miss to visit the 2018 Auto Expo to get a first hand touch and feel experience of the all-new Maruti Suzuki Swift.